Zoya is at it again! Today, I have a preview of their Summer 2014 Collection: Tickled and Bubbly! Both have 6 colors and are sure to be excellent. The Collection is available for pre-order today! "Laugh, Giggle, Chuckle and Smile! 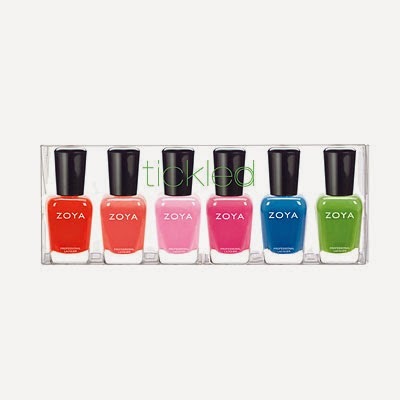 Welcome to a happy Summer season of long-wearing, feel good BIG5FREE* nail color by Zoya featuring two new collections destined to bring out your inner Glee!" Ling: a true blue in a flawless full-coverage cream formula. Tilda: a mantis green in a flawless full-coverage cream formula. Rooney: a Hollywood pink in a flawless full-coverage cream formula. Kitridge: a carnation pink in the flawless full-coverage cream formula. Wendy: a tickled pink in a flawless full-coverage cream formula. Rocha: a folly red in a flawless full-coverage cream formula. Each color is $9.00 ea. 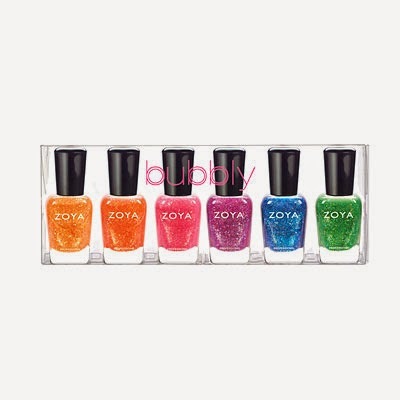 (US) and AVAILABILE MAY 15, 2014 on Zoya.com. Please Comment, Like and Share this post! Don't forget to like my Facebook page, follow on Twitter, Instagram and Pinterest!